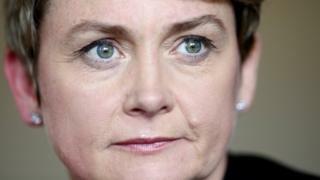 A man arrested over threats made to Labour MP Yvette Cooper has been given a conditional caution. The 59-year-old Leeds man was arrested in Castleford on Friday, 1 February over threats to the Normanton, Pontefract and Castleford MP. West Yorkshire Police said the man was held “as a result of information received in relation to alleged threats against a serving MP”. On Tuesday West Yorkshire Police said the man had accepted the caution. The nature of the alleged threat or whether it was made on social media was not disclosed by police. Ms Cooper’s office declined to comment. The Crown Prosecution Service (CPS) has been asked to disclose the conditions of the caution. Ms Cooper had previously contacted police after receiving a message she said threatened the lives of her children. The threat followed the murder of Batley and Spen Labour MP Jo Cox by Thomas Mair, a week before the EU referendum vote in 2016. On Saturday Paula Sherriff, the Labour MP for Dewsbury, said a decision by the Crown Prosecution Service not to bring a prosecution after swastikas were left outside her constituency office was “disgraceful”. The Dewsbury MP said foil swastikas were left at her constituency office on three occasions last summer (2018). The suspect received a harassment warning instead.